Another post I've written for 10thousandgirl. Saving can be a challenging idea to many, but when you break it down, it actually ain't that bad! We all know that saving is a good thing but how many of us actually do it? 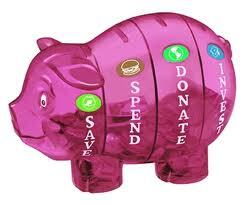 Taking a little time to work out what you are saving for and what savings strategies work for you will pay off. Literally. We’ve put together a simple 6 step process for helping to build your savings. 1. Having a motivating reason to save should be your number one thing to do. To save towards a goal for later spending such as big ticket items or events like holidays, starting a business, house deposits and weddings. Being clear on what you are saving for, and why that reason is important, will keep you more motivated. For example, I want to save for a house deposit so I can live in a place I call a home. Somewhere safe, cosy and a place I can entertain my friends and build my family life. Or, I want to save a certain amount of money so I can start the business I’ve been dreaming of. It means that I will be able to work flexible hours and give value to people. 2. Work out how much and by when. Setting a savings goal. Come up with a specific amount. You need to be clear. Also, set a specified timeframe. Then break it down. For example, I’d like to save $3000 for a holiday in September. Which means I have 8 months to go. 3000/8=375 and I get paid fortnightly, so I would need to put aside $187.50 per pay. Is the break down realistic? Use your budget to see how much you can save each pay. Remember, you don’t want to have it so tight that you are sacrificing too many things to achieve this amount. Once you have worked out how much you need to put aside, set up an automatic savings plan with your high interest savings account. One way of doing this is to set it up so it automatically takes out the $187.50 the day after you get paid. This takes the thinking out of building your savings. There are also other ways you can save money in your everyday life. One of our 10thousandgirls suggested saving every $5 note you get. Or put some clear glass jars aside for your goal and add coins to it whenever you come home. Get on your bike and ride to work and save the bus fare. If you have other suggestions you’d like to share please do so on this blog post. Another thing to think about when you are building savings is spending less. This may be through shopping smartly, cutting down on luxuries and negotiating with your telecommunication and other suppliers. Our other topic of the month is smart shopping so look out for upcoming podcast and other resources around this. 5. Check in and keep track. Stay motivated. Once you start the ball rolling, do a few things to help you stay on track and motivated. See your savings amount grow on a regular basis. Some high interest savings accounts have graphs that you can refer to see the amounts you have saved so far. It can be quite satisfying to watch the growth! Also, regularly remind yourself of the reason you are saving for and the feelings you will experience when you get it. You could also share your goals with a trusted friend that will help keep you on track. Once you reach your goal, don’t forget to celebrate! This may take the form of a toast to yourself, a luxuriating bubble bath or that mani/pedi you’ve been putting off. Just make sure the celebration doesn’t cost you too much! And then enjoy the holiday/house hunting/fridge buying experience. So, know what you are saving for and why, choose some strategies that work for you, keep yourself motivated and on track and then enjoy the result. And then celebrate away! Go get saving gals! All of the above are only suggestions. Please ensure you choose a strategy that is right for your situation and needs.